This was a taken in a park I used to do a good bit of fishing in. While the fishing was never that spectacular, I remembered this long, tree-lined path leading from the entrance to some of the back ponds. When I arrived and met with my clients, the sun was setting to the right of the path. With a small pond reflecting that late afternoon light, the path was aglow is some of the softest light I have ever seen there. I positioned the family just beyond the path's entrance, where the trees shaded the ground, yet close enough that the light didn't break through and completely light them. The result is what you see here - an image with only minor editing adjustments. This is what makes fall a glorious time for family photography. The light is soft and beautiful. The fall colors take on a life of their own, adding color and drama to the surroundings. The fallen leaves line the trails and paths, often acting as a cover the the barren ground below. 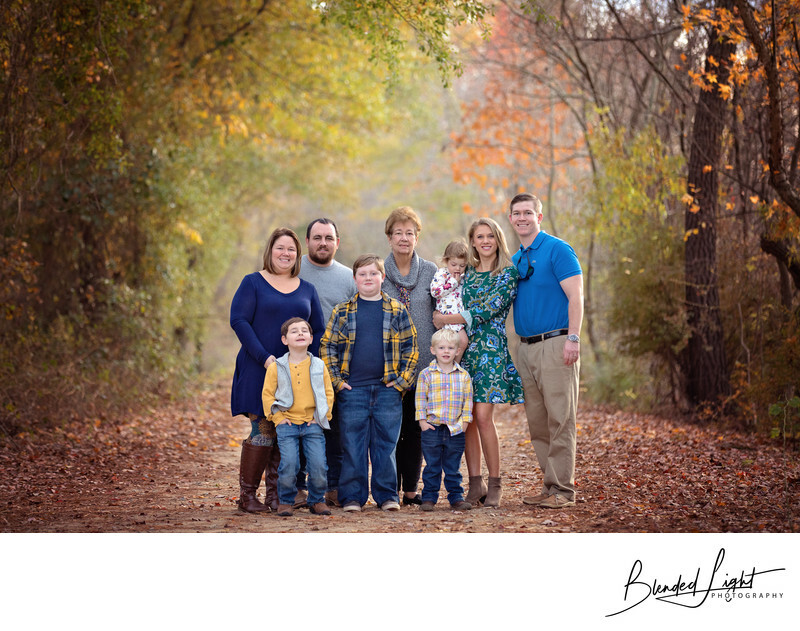 While anytime of the year is perfect for family pictures, fall brings a special blend of factors (the low sun, the gorgeous colors, the cooler temps) that have a tremendous effect on the feel of the pictures. Unlike summer, where the clothing choices are relatively easy to figure out, fall brings the challenge of coordinating not only between the family members, but also coordinating with the fall colors and the temperatures on a specific day. However difficult that may sound, it actually makes things easier. You dress like you would for the day in colors that fit the fall. That means sometimes you wear sweaters over t-shirts and sometimes you wear polo-style shirts. For this day, the tempertures were slightly above normal for early December. The family is dressed with lighter clothing, appropriate for the day, and easily tying in the fall colors.